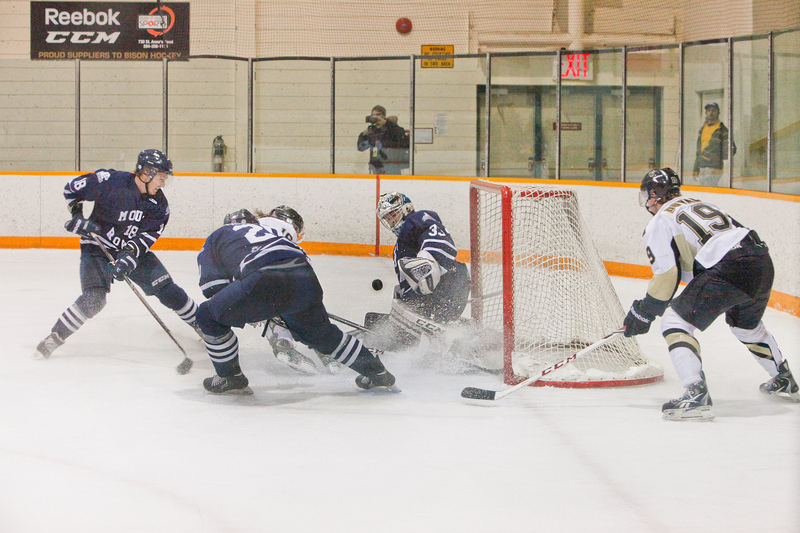 Bison men's hockey team in action against the Mount Royal Cougars. 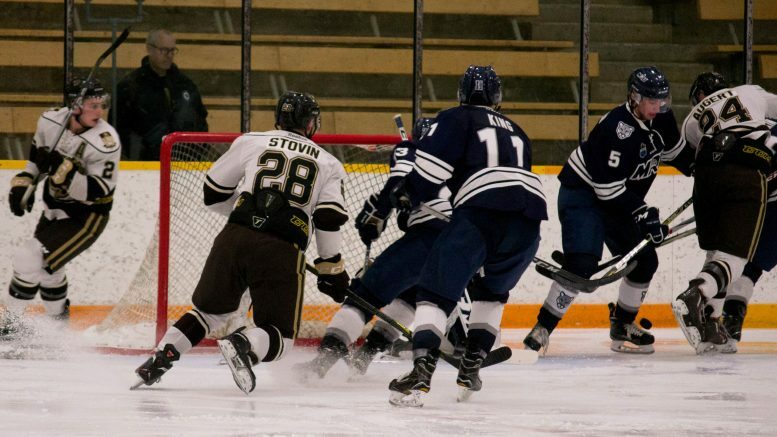 After sweeping the Mount Royal University Cougars, the Bisons were looking to continue their good run of form. They smacked the Cougars on Friday night, registering a 6-1 win. Six different players scored for Manitoba. Quintin Lisoway scored his first goal since Oct. 7, and registered an assist. Brett Brooks had a goal, as well as two assists, in the win. Byron Spriggs made 31 saves between the pipes. 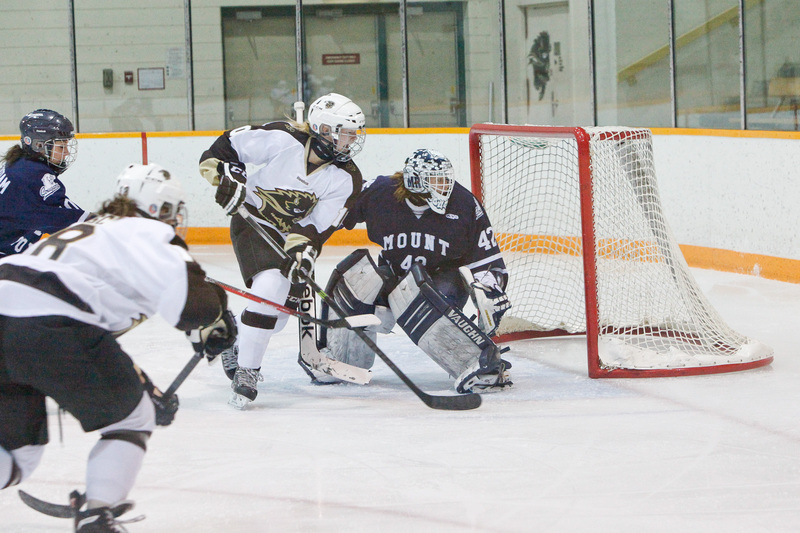 Dasan Sydora got the start for Manitoba on Saturday afternoon, making 46 saves in the double overtime 6-5 win. The Bisons led 5-4 until late in the third when the Cougars scored with 56 seconds remaining to level the score. Kamerin Nault was the overtime hero, scoring his second goal of the weekend and fifth of the campaign. The pair of wins puts the Bisons in fourth in the Canada West with a 6-4 record 10 games into the season. Manitoba is one point back of third placed Calgary ahead of a road series against the University of Lethbridge Pronghorns on Nov. 17-18. The women’s team fared better than their male counterparts, managing a split against the Pandas. The Bisons move to 2-4 and are tied for second last in the Canada West six games into the season. Second year right side hitter Kearley Abbott had a combined 25 kills on the weekend for Manitoba. Abbott is averaging 3.08 kills per set, good enough for eighth in the Canada West. The third ranked men’s team could potentially fall out of the U SPORTS top 10 with their record falling to 1-5 after being swept aside by the Golden Bears. Fifth year left side hitter Adam DeJonckheere led Manitoba both nights, combining for 17 kills on the weekend. DeJonckheere is now up to 68 on the year and entered the top 10 all time in the Canada West points with 1,307.5. Manitoba now sits in a tie for 10th place in the Canada West. The Bisons will head home this weekend to take on the MacEwan University Griffins in a two-game series at the Investors Group Athletic Centre.